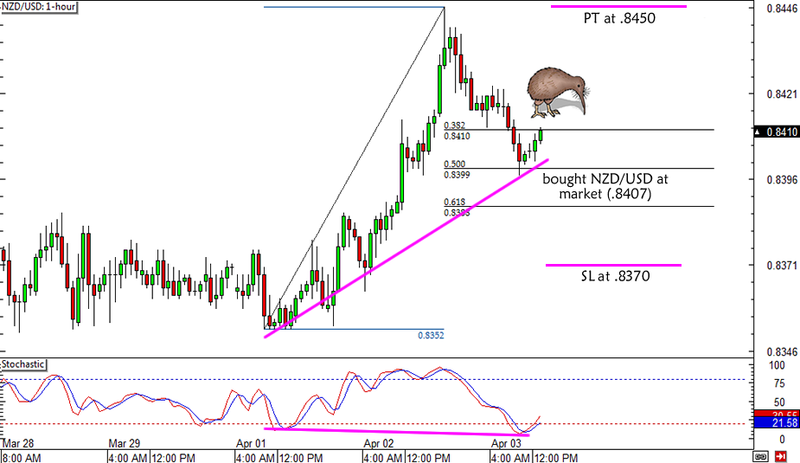 NZD/USD: A Day Trade and a Fib Play: Kurodaheck?! Oh dear, not another heartbreak! 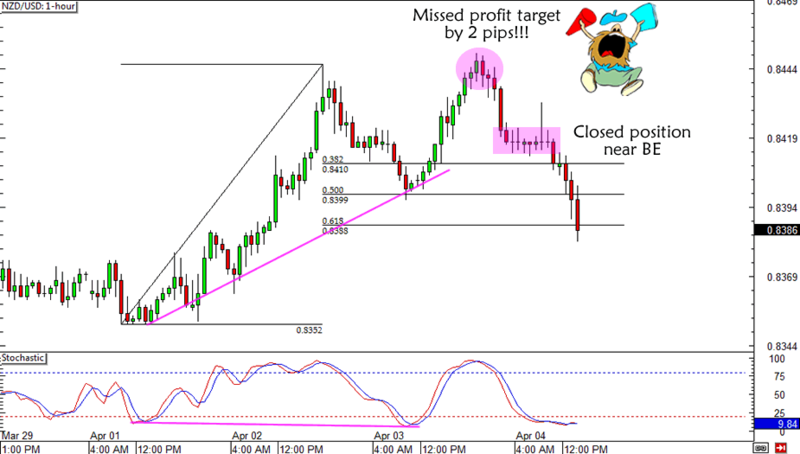 NZD/USD was a hairline away from hitting my profit target at .8450 before it changed course and sold off. I didn’t bother closing the trade manually when the pair traded around .8448 – That was just two pips away from my PT! TWO MEASLY PIPS! Weak U.S. ADP jobs data and ISM non-manufacturing PMI already gave NZD/USD a boost but the pair was unable to sustain its rally when risk sentiment took over and weighed on the higher-yielders. It didn’t help that Kuroda’s first interest rate decision sparked a massive USD/JPY rally that the dollar-buying carried on to other major pairs. Because of that, NZD/USD slid back to the .8400 area during the Asian session and, with a heavy heart, I just manually decided to exit my trade early. European traders have yet to wake up, have their breakfast cereal, and react to the BOJ decision, which could mean more dollar rallies later on. While I’m extremely frustrated about chalking up yet another loss when I was THIS close to a win, I’m happy about the fact that I got the direction correct and I managed to limit my losses. But oh, I sure could use some cheering up and a bit of comfort food today! 1. New Zealand’s commodity prices released yesterday blew expectations out of the water (7.4% vs. 1.1%). This followed the upbeat surprises that we saw in the country’s GDP and trade balance reports over the past couple of weeks. 2. The RBA didn’t cut its interest rates, Australia printed a strong trade balance report, and China will be on banking holidays after releasing a strong services PMI. 1. NZD/USD just bounced from the .8400 major handle, which is near the previous week’s high and a 50% Fib retracement on the 1-hour chart. And have you seen the bullish divergence that could most likely play out? 2. The next possible resistance is at the .8450-.8460 area, which would give me a good R:R if I place my stop just below the Fibs. Long NZD/USD at market (.8407), stop loss at .8470, profit target at .8450. What do you think of my plan? Good enough for a couple of pips? Don’t forget to read the risk disclosure if you’re planning to trade with me!